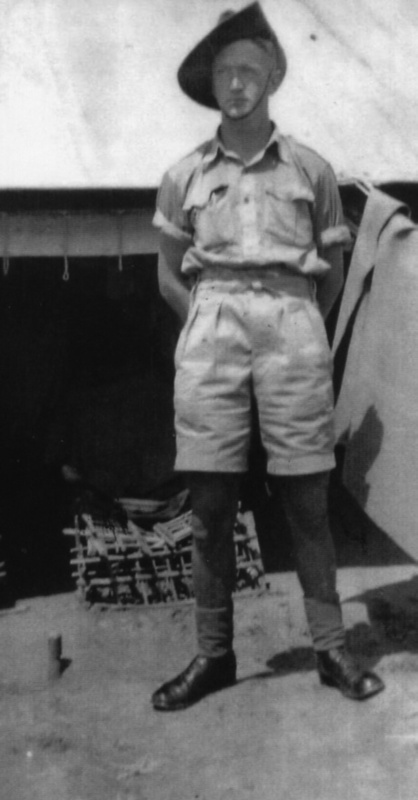 Frank Hudson standing outside a tent. "On page 45 of my book Flies, Fleas and Sand I refer to an unfortunate & sad incident which cost the regt its first three casualties since leaving Mersa Matruh Fortress & being engaged on the Eqyptian frontier, I believe the kin of these soldiers would be pleased to read about how these deaths & wounding occurred, if not already known. This then is how it was told to me & two other mates by our Captain Mackay after returning from the explosion site. The battery had stopped for the night & preparing the evening meal, being scattered in various areas eg. gun crews, O. Pip parties, etc. Suddenly the silence was broken by a huge explosion, followed by much black & white smoke. Our O. Pip Officer Mackay & our driver Gnr Ben Fenton sped off to ascertain the cause, we being the closest to the explosion site. Our Captain on arriving back gave us the morale lowering news, that two of Sergeant White's gun crew had died & one was severely wounded. These deaths & wounding was due to the kicking & or moving of an enemy dud shell, these could be found lying around in various places in the desert. "Unexploded Ordnance" to give them their correct title. In this situation, be it shell, mortar bomb or grenades are at their most dangerous. To explain a dud shell is one, that has been fired from a gun & failed to explode at its target. It means the fire channel in the shell is open & stays in this very dangerous condition "ad infinitum" or until handled correctly, defused & made safe. We dont know who kicked this dud shell, but we do know it was not Frank Hudson. Sergeant White had mentioned to me at a post war reunion, that Gnr Frank Hudson before he died had whispered to him, that he had told the others not to touch the shells. That leaves Gnr Kestles who died & Gnr Keith Joyce, who was so badly wounded, that he was invalided back to Australia. He now lives in Launceston. I'm sure Keith would be able to explain just exactly what happened & who did what. This accident in hindsight should never have happened, for we had received some lectures on booby traps & unexploded ammunition, nothing quite the same as being exposed over a long period to the actual danger. So many horrific things happen in war & many unexplained."